Based on a graphic novel, this apocalyptic adventure centers on a man who must reverse the cataclysmic conditions of his world. Ken is backstabbed by Shin (Fist of The South Star) who kidnapped his love, and claimed Kens powers to stop conflict . So Ken now almost dead , goes through the post apocalyptic wasteland to learn to fight for the innocent ,and reclaim his title as the legendary fighter . Jagi: Shin has broken all the rules and the thing that Ken trusted him like a brother, but we are his brothers. You are the strongest Raoh. You got to get down there and challenge Shin to a fight. Jagi: You know you can take him. Now with Ken out of the way, you will be the fist of the north star. 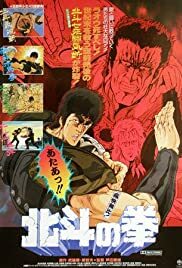 Q: Is Fist of the North Star based on a book? Q: Is there a uncensored version? All the gory violent scenes have funny colors! Watching Fist of the North Star proves to be an anime experience like no other. Surprising, as it may seem, the perspicuous rough-and-tumble attitude made this film an instant classic in its genre. Being mostly an expressive testosterone-infused bloodbath, Fist of the North Star presents its own thought-provoking nature with utterly graphic scenes of animated violence. And still, it's able to draw one's attention with the engaging and fast-paced storyline about a post-apocalyptic universe, where people have given up their faith in humanity and exterminate each other in a grizzly fashion. Note: this is a review of the version released in the United States, with English dubbing, and with the original ending from the first official release. After the opening credits fade away the movie attacks with a heavy thump. Literally in the blink of an eye, even before we get acquainted with the main characters, bones start to crack and blood starts to spill all over the screen. As it's soon revealed, those two men fighting in the middle of a vast dessert are former friends, who are now deadly enemies both seriously in love with one beautiful girl. The only problem is that Julia (voiced by Melodee Spivack) is engaged to Ken (John Vickery), who, after this short combat, is very close to death. In order to save her fiancé she agrees to go with the evil Shin (Michael McConnohie), leaving semiconscious Ken in the lurch. And if this wasn't enough, a few minutes later two mysterious strangers grab his lifeless body and throw it into a deep hole. A year passes and all the previous events gradually begin to connect, just to unravel the actual meaning behind the whole blood-soaked intrigue. While saving two youngsters from the vicious hands of slow-witted bullies Ken shows his – this time bearded – face once again. Chock-full of revenge thoughts, he embarks on a dangerous journey not only to save his woman, but also to discover the sense of his existence in this chaotic, stolid world full of thugs. Paradoxically, apart from Shin, the people who stand on his way to happiness are his two brothers Jagi (Dan Woren) and Raoh (Wally Burr). Following various traces Ken slowly claims his vengeance through the indelicate art of kick-and-punch, which – for the viewers' sick amusement – always results in spectacular head explosions. Those people who've read the manga or watched the anime series of the same name won't be surprised by anything that happens throughout the whole film. The only shock might come from the extensive brutality that beams from the screen. As for those who don't know the story – at first, it might be hard to follow the events without being a little confused. Fortunately, due to the film's well-balanced plot everything begins to make sense after a short period of time, giving the viewer a great amount of proper fun. The picture's rather simple, even obscure, animation leaves a lot to be desired. In comparison with the TV series, the theatrical version doesn't really upgrade the raw visual style. Also, when it comes to character development the movie fails miserably. Every individual is mindlessly implanted into the storyline, leading to a contest of poor one-dimensional encounters. What's more, the cheesy English dubbing gives the characters a nerve-racking attitude, only worsening the final effect. That's why it's better to restrain from evaluating their personalities and focus on many thrilling, gore-ific action sequences instead. Surely, this aspect of Fist of the North Star won't disappoint anyone.